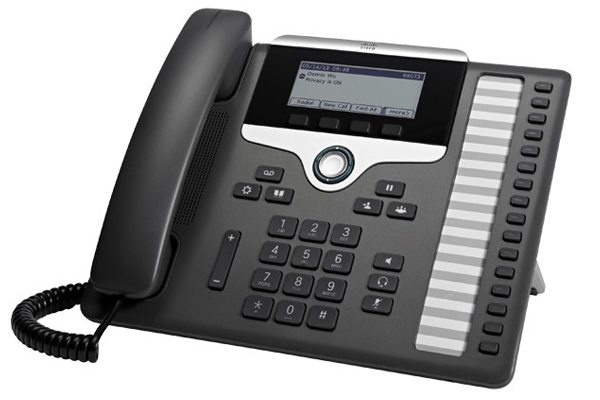 Get simple, highly secure, and cost-effective voice communications for small to large businesses with the Cisco IP Phone 7861. The 7861 is an ideal endpoint to meet the active communications needs of managers and administrative staff. A 16-line endpoint with programmable line and feature keys for administrative staff, managers, contact centre agents and supervisors who require active voice communications support. It comes with a paper label insert that you can locally print to customize its line and feature key labels. The 7861 includes an IEEE 10/100 integrated switch. It comes in both charcoal and white colour. ● White backlit, greyscale, 3.5” 396×162 pixel-based display on the IP Phone 7861. ● The handset is a standard wideband-capable audio handset (connects through an RJ-9 port) for the IP Phone 7861. ● The default handset is a standard narrowband-capable audio handset (connects through an RJ-9 port), and wideband on the handset is available with the purchase of an additional wideband handset. ● The analog headset jack is a standard wideband-capable RJ-9 audio port for the IP Phone 7861. ● The IP Phone 7861 includes a default black bezel (replaceable), and an optional silver bezel is also available separately. ● The hookswitch can be controlled electronically with a third party headset connected to the auxiliary port for the IP Phone 7861.